Heads up, pound bulls! 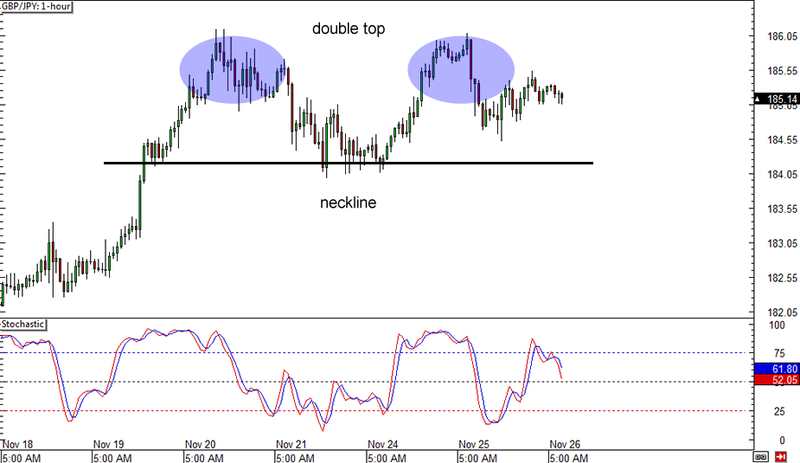 GBP/JPY seems to be forming a reversal chart pattern on its 1-hour forex chart, as a double top can be seen. Price is still around a hundred pips away from the formation’s neckline, which is around the 184.00-184.25. A break below this level could confirm that further losses are in the cards, which might amount to as much as 200 pips. Stochastic is moving out of the overbought area and indicating that sellers are in control for now, but a bounce from the 184.00 mark might still lead to a test of the previous highs around 186.00. 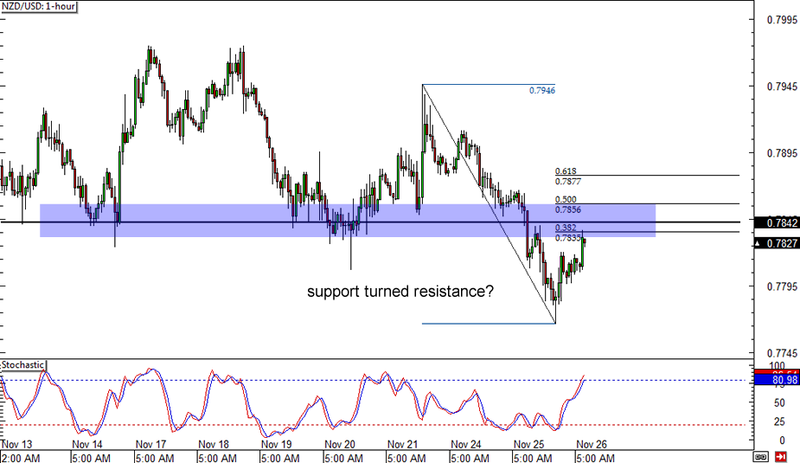 Here’s a simple Fib retracement play on NZD/USD’s short-term forex time frame. After breaking below the .7850 support level and dipping below the .7800 major psychological mark, price has pulled back up to the area of interest. This is near the 38.2% and 50% Fibonacci retracement levels, which might act as resistance from now on. Stochastic is still climbing, which suggests that the correction is still taking place and that price could pull up a little bit higher. If you’re thinking of shorting this pair on a pullback, make sure you set your stop past the 61.8% Fib! Check out this short-term consolidation pattern on USD/JPY’s 1-hour forex chart! The pair has formed higher lows and lower highs, creating a symmetrical triangle formation. Price is currently testing the bottom of the triangle and may bounce off support around the 117.75 level, as stochastic is almost in the oversold area. 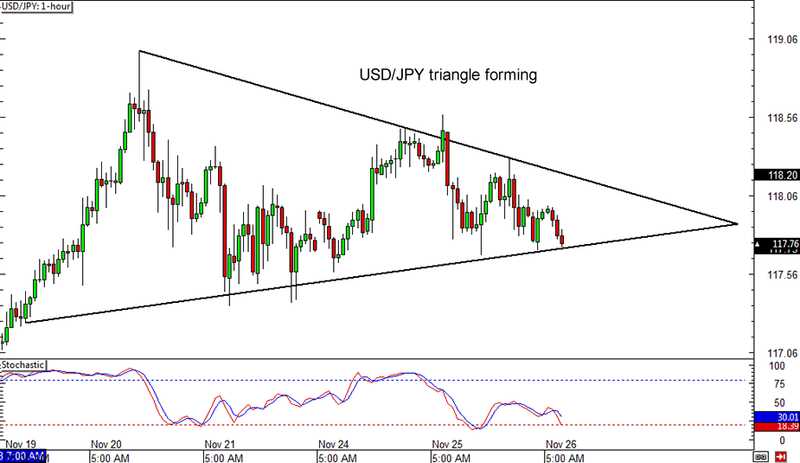 If dollar bulls charge, they could push USD/JPY back to the top of the triangle around the 118.25 level. However, if dollar bears stay in control, a downside break could be possible and the pair could fall by close to 200 pips, which is the same height as the chart pattern.